Devotional time is usually "quiet time"--a moment to sit and reflect on Scripture and connect with God. Hands-On Bible: 365 Devotions for Kids will reignite and energize your family devotions. Your kids will be giggling, singing, dancing, creating, and getting excited about the Bible all while praising God and growing closer to Him. 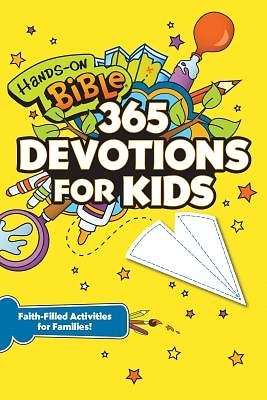 Each of the 365 action-filled devotions comes to life with fun activities and games using regular household items. No need to run out and buy extra supplies With Hands-On Bible: 365 Devotions for Kids, your children will get into the Bible, and the Bible will get into their hearts, giving them a priceless foundation of faith in God.